Christmas is also a jolly season we celebrate with feast! 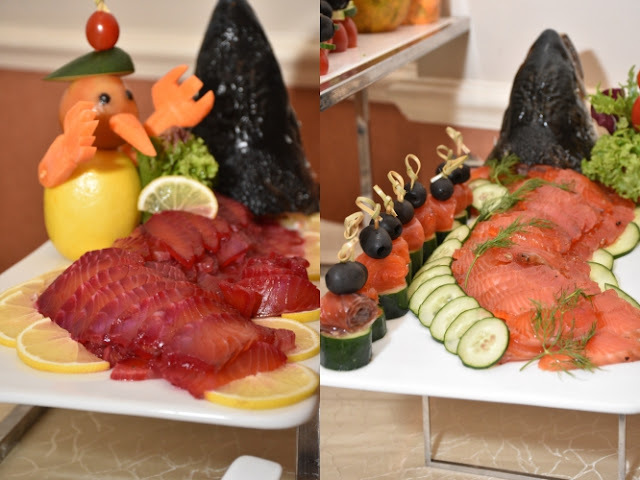 If you still have no plans during Christmas eve, Christmas Day, New Year's Eve and New Year's day, why not check out this latest promotions offered by Sarkies @ Eastern & Oriental Hotel? 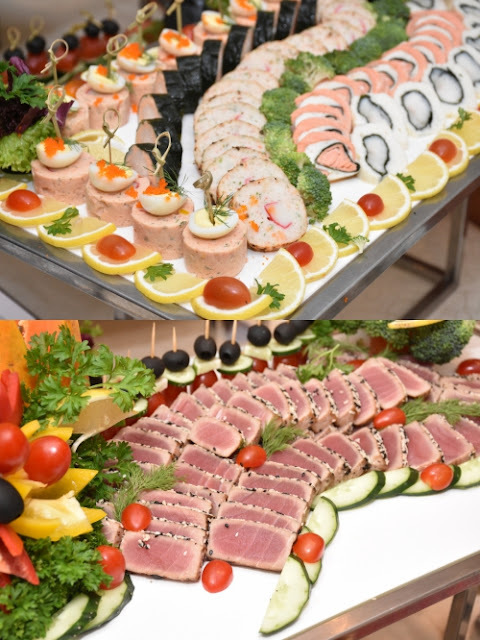 Well known for its lavish buffet spread, Sarkies @ E&O Hotel is also serving sumptuous buffet meals for their guests this festive season featuring all the signature Christmas and New Year dishes to celebrate this jolly season. 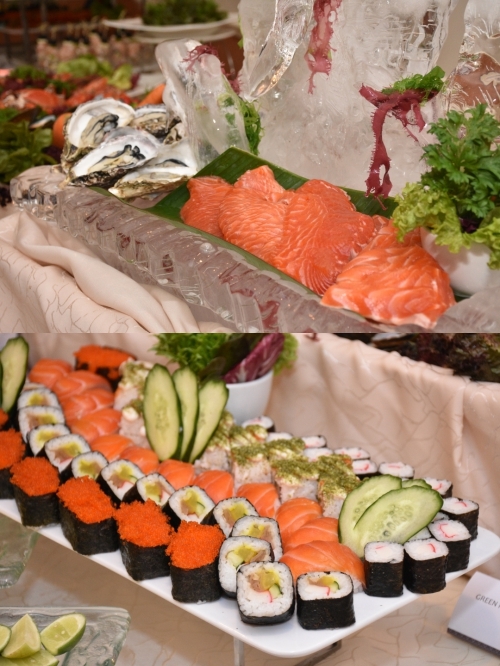 Salmon and assorted sushi, my favourite corner of the buffet spread. Sashimi slices nicely presented for the Christmas feast! All the juicy and delicious seafood on ice. Apart from that, the international buffet menu spread also includes local specialties like assam prawns, and western cuisine such as lamb shanks, roasted chicken and many more. Roasted Turkey will always be paired with delicious sides like stuffing, roasted potatoes, brussels sprouts and etc. A plate of delicious turkey feast with brussels sprouts and juicy stuffing. A bowl of rich and creamy Pumpkin Soup. 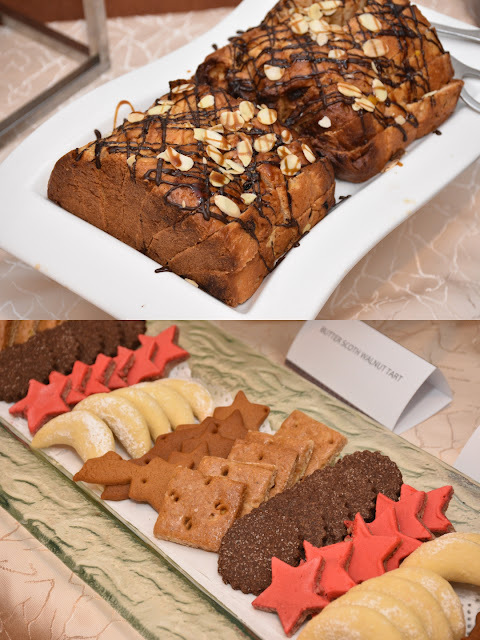 Sweet tooth would not want to miss all the mouthwatering desserts specially prepared by the chefs. 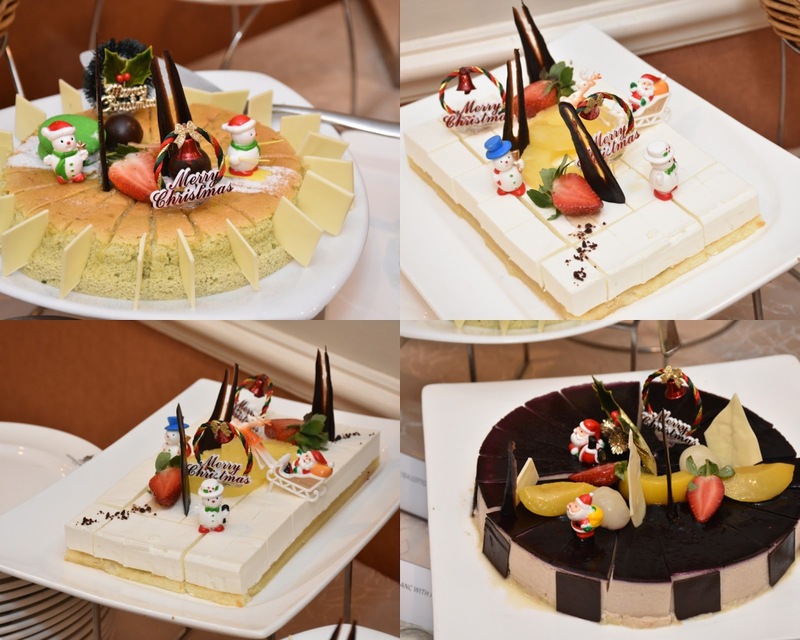 There are different cakes that nicely decorated to celebrate this Christmas! 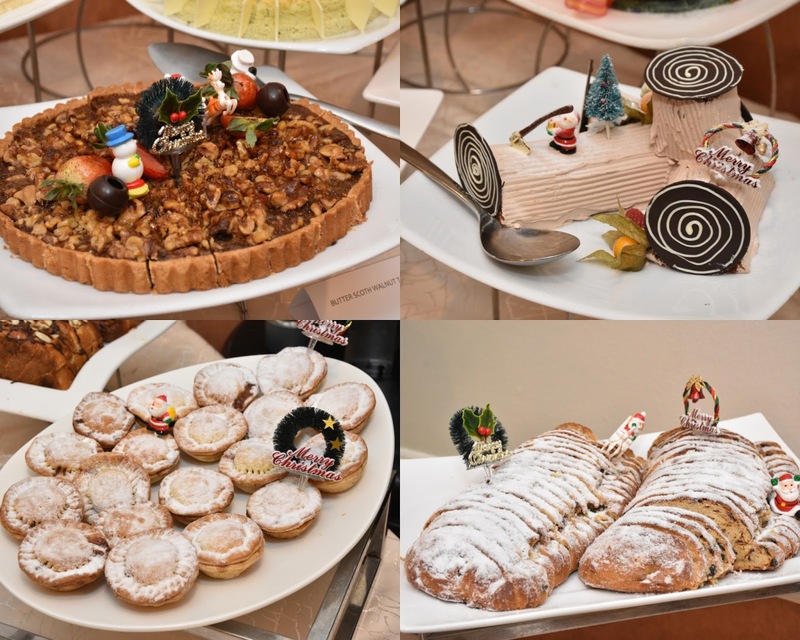 Below there are Mont Blanc- Pina Colada, Green Tea Cotton Cheese Cake, Panettone, Christmas yule log, Butterscotch walnut tart, Minced pie, Christmas stollen and many more. Ginger bread & Assorted Christmas cookies. Christmas is the season that we will gather with friends or family and celebrate it in some nice cafe and restaurant with good food! 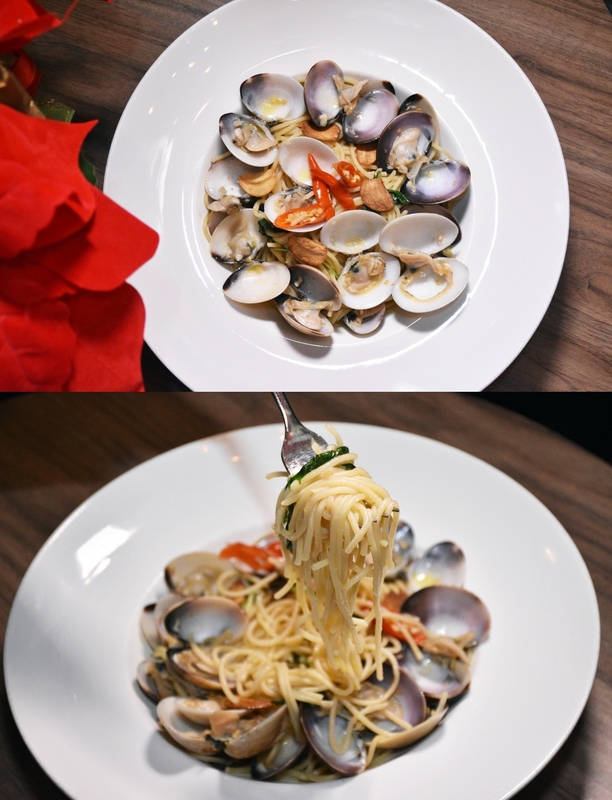 In this jolly season, DCOVA Cafe has launched their new menu featuring new pasta for all the pasta lovers in Penang! If you have visited this cafe before, you would know that DCOVA offers wide selections of Japanese inspired pasta menu and since the opening until now, it is still serving the best pasta in town. This coming season, 3 new pastas have been added into the current menu and now offering more seafood selections on the new menu. One of the highlights would be Spaghetti Alle Vongole, a new seafood featuring a generous amount of huge, juicy and fresh clams. You can tell from the picture that the clams have flooded the plate and covered the whole spaghetti. DCOVA never fail to impress customers with their al dente pasta, it is always the right texture. This pasta features the freshness seafood with a hint of chinese wine in it. The pasta was pretty appetizing and the clams were big and juicy, cooked to perfection. It is reasonably priced at RM27.00 with the big portion served. If you prefer some tomato based pasta, you could go for the Seafood Bolognese, an additional seafood pasta that carries the fresh seafood with slight sourness from the bolognese sauce. I personally pretty the other seafood pasta as I'm a person who loves the original taste of seafood rather than covering it with sauces. Another highlight on the new menu is their pesto based pasta, Pesta Pesto priced at RM25.90 for a big plate of pasta filled with back bacon and mushroom. DCOVA created their unique blend of pesto sauce made from scratch with fresh basil leaves. The creamy pesto is rather appetizing and feels pretty refreshing at the same time. I like how it was cooked and served with the deep fried garlic that was crispy and extremely fragrant, and most importantly great to go with the pasta. Other than the new menu, the signature pastas from the previous menu such as the Chicken Teriyaki Pasta, Squid Ink Pasta and many more are still available on the menu. Those are all my favourites and they are still my favourite until today, I'm always having dilemma issues whenever I visit this cafe looking at the menu and not sure which to order cause all of them are good and impressive. Coffee addicts must order their Aussie Strong Latte, the only drink I always order in this cafe. It is their best seller here and the coffee is stronger than the normal latte, my kind of bitter coffee with strong body. Together with their new menu, DCOVA also came out with a few new beverages to compliment the all new pastas. In picture below is the newly introduced Blue Rhapsody made of orange peel, lemonade, yoghurt, fresh milk, vanilla ice cream, fresh lemon juice. A very appetizing ice blended drink. Also there are a few new caffeinated and non-caffeinated drinks. There are always something for somebody. Something must not miss, the Affogato! All time favourite and their best seller! To commemorate this festive season, DCOVA is giving away their homemade fruit cakes for FREE with a minimum of RM150 spending on the total bill! We have tried their fruit cake and I kinda like the strong taste of alcohol in this cake. Perfect to celebrate this Christmas, the joyous season! Seafood lovers has got a new place to savour a freshly grilled Boston lobsters that flew in all the way from America to Penang! 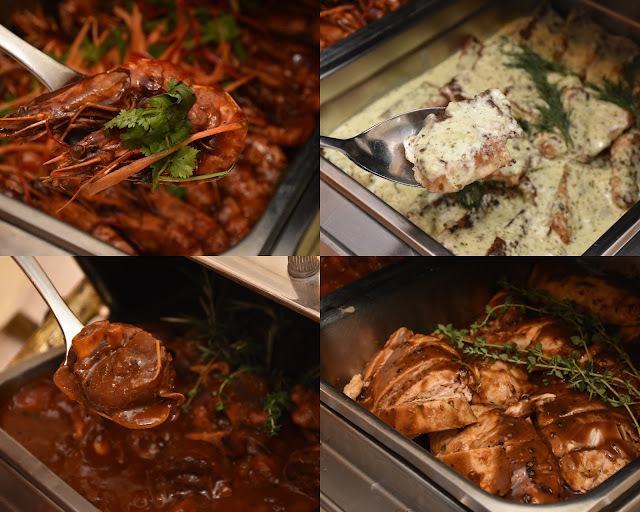 Since the opening of Crab & Lobster in Penang last year, the restaurant attracted a lot of visitors to enjoy their seafood feast at the outlet. Crab & Lobster is located at the ground floor of Straits Quay. If you are at the entrance of mall, you just have to look for Dome and head all the way to the end of the row. The restaurant serves fresh and live seafood, all the dishes will be cooked upon customers' orders. 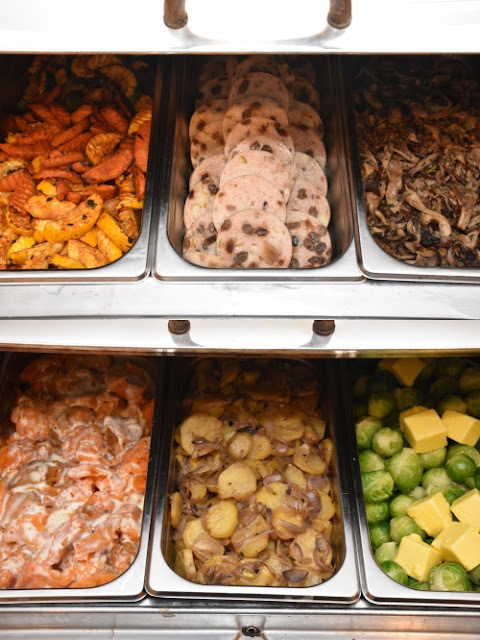 Crab & Lobster carries Alaska King Crab from Alaska, Boston lobsters, from America, Brown Crab from England, live oysters from all around the globe and also some local seafood like shrimps, clams and mud crabs. In conjunction with their 1st anniversary, Crab & Lobster has recently launched their new menu featuring the Grilled Boston Lobster that will be grilled upon order! All the seafood will be served fresh and juicy! The restaurant can accommodate big groups, so even if you have like company dinner or gathering with friends or family, Crab & Lobster would be a great choice for that. Outdoor seatings are also available, would be great if you want to enjoy some sea view at this great place. The restaurant even provided you with a guide on how to savour Lobster in the elegant way! This is totally perfect for a noobie like me! Mr.Brown Crab! You must have been through a lot of challenges flying all the way from England! All the juicy and delicious looking Boston lobsters, very lively and fierceful! Alaska King Crab, looking very creepy and aggressive! 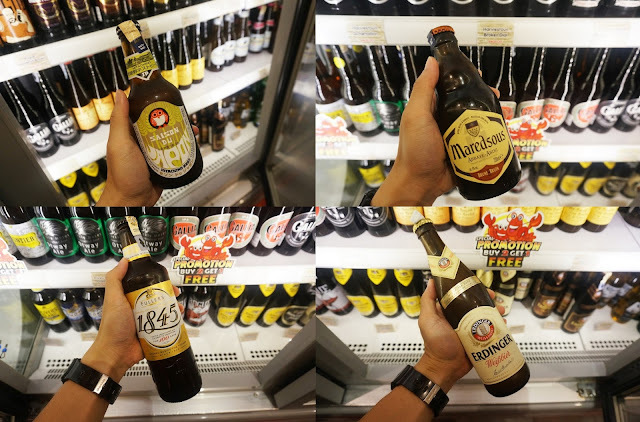 Crab & Lobster also carries more than 100 types of beverages in the restaurant. There includes imported wines, beers, juices, soft drinks and many more. There are also promotions from time to time, some are selling at 50%, some are with the "Buy 2 FREE 1" or "Buy 3 FREE 1" promotions depending on the availability. Freshly grilled Boston lobster anyone? Introducing the new item on the menu, Triple Grilled Lobster by Crab & Lobster! Every set of Triple Grilled Lobster is served cajun fries and mixed salad, and of course there is a fresh and live whole Boston lobster. The Triple Grilled Lobster adapted to the 3 secretive grilling methods to get this lobster done. While maintaining the moisture and juiciness of the lobster meat, they can still make the lobster done perfectly with their triple grill method. 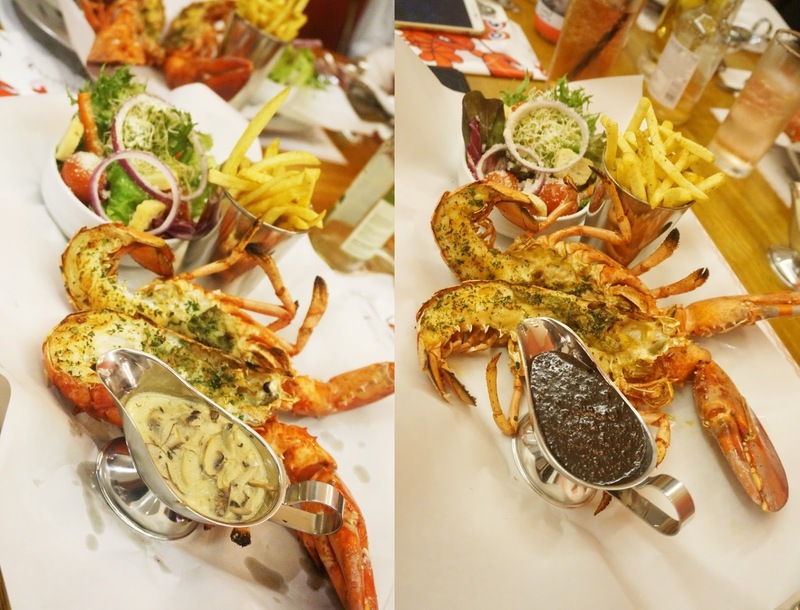 The Triple Grilled Lobster comes with a selection of Signature Mushroom Sauce or Black Pepper Sauce. While the signature mushroom sauce was quite creamy and filled with a generous portion of mixed mushrooms in the sauce, which is perfect especially if you are a family with kids. On the other hand, I believe Penangites would prefer something exotic and would go for their Black Pepper Sauce that was pretty good and a little bit hot to stir up your taste bud. I can taste something different in their Black Pepper Sauce which got me very appetizing and enjoyed it very much with the lobster and also the fries. The rich and creamy Signature Mushroom Sauce? Or the exotic spicy and appetizing Black Pepper Sauce? Other than the new items on the menu, the old menu is still available where Crab & Lobster will serve their fried seafood combo 'On The Table' or 'In The Pot'! The combos are Live Alaskan King Crab Leg Combo, Live Lobster Feast, Live Crab Feast, Live Brown Crab and Shrimp Bag! All the seafood combos are served with a complimentary tray of Deep Fried Mantou and Cajun Fries! How good is that?! There are 5 types of sauces available for the seafood combo which are Crab & Lobster Signature Sauce, Black Pepper Sauce, Chili Crab Sauce, Garlic Butter Sauce and Dry Curry Sauce! The highly recommended sauces would be the Crab & Lobster Signature Sauce and Chili Crab Sauce. Fresh oysters are also one of the highlight in Crab & Lobster! They have all type sof oysters that freshly flew in from all around the globe including France, Ireland and many more! If you are looking for a delicious and fresh seafood feast, Crab & Lobster is definitely the right place to meet that requirement! And now with their new menu lauched, you have more options to go for! Check out their restaurant or get updated with their Facebook page for more info! Address: Straits Quay Marina Mall, Lot 3A-G-7 Ground Floor, Jalan Seri Tanjung Pinang, Tanjong Tokong, Penang, Malaysia. Melomaniac always equip themselves with some great gadgets to enjoy good musics! Now with Vasa BLÅ by Sudio Sweden, all that bass, rhythm are filled in your ears, just like having a live concert in your ears. This in-ear wireless earphones are exactly what you are needing to ease your music craving! Whether are you working out at the gym, enjoying your afternoon cup of coffee, casually walking around the malls. You need nothing other than good music to make yourself feel comfortable even when you are alone, the time where Vasa BLÅ by Sudio Sweden would come in handy. 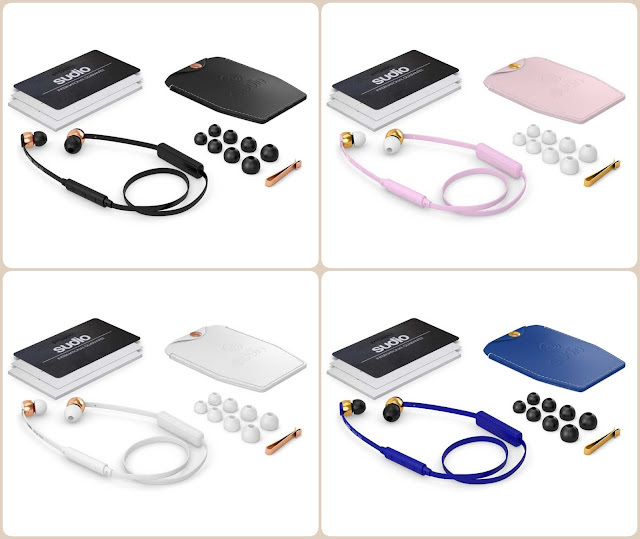 Many of us would hate earphones which usually tangled together and made it rather troublesome to have to separate them every time, but with Vasa BLÅ by Sudio Sweden you could save all these mess and everything would come in chic and stylish. The latest invention, Vasa BLÅ is a wireless earphones that works with the Bluetooth features in your smart devices such as smartphones or tablets. Now with Vasa BLÅ you can enjoy all the audio effect and being tangled-free all the time! The day I received my package from Sweden I was pretty happy to receive this great invention by Sudio Sweden. My first reaction was to charge it and couldn't wait to test it myself! The moment I put it on my ears, I was really enjoying myself with all the clear music, the strong bass, and the every single songs I played was like a concert to me. Vasa BLÅ by Sudio Sweden comes with a set of quality accessories including 10 earbuds of different sizes to caters to all your need, a set of Vasa BLÅ, a rose gold metal pin to clip the earbuds on your shirts so you can avoid losing them, an USB charger and also a beautiful yet elegant looking leather pouch for your Vasa BLÅ. All these quality accessories comes with a box of Vasa BLÅ and you do not have to worry about losing your earbuds because they have many spares for you! Also if you are having different sizes of ear canal, these earbuds of different sizes would be just perfect to fit you! What attracted me most is the beautiful and elegant leather pouch that could protect your wireless earphone and yet looking chic and stylish. No doubt Vasa BLÅ is one of the most stylish wireless earphones in the market. The flat cable that allows you to store your earphone safely and tangled-free, also protecting your earphones from damages while you store them in your bags or pockets. Also, the only 3 buttons available on Vasa BLÅ allows users for easier and friendlier control and you don't have to figure out which button for song changing and all troublesome shortcuts. Vasa BLÅ by Sudio Sweden comes in 4 different colours! It is available in Rose Gold Black, Rose Gold White, Blue and Pink! Not just the design but also the colours are pretty attractive! There must be something for everybody so you don't have to worry about it! And also Vasa BLÅ could be great as a gift for any occasions! Quality Music For 8 hours! The battery life of Vasa BLÅ allows you to continuously play music for 8 hours! With this strong battery life, Vasa BLÅ can also standby up to 10days which make your life easier instead of charging it again and again like other wireless earphone with shorter battery life. What makes it even better is the Fast Charging feature that you only need to quick charge your Vasa BLÅ for only 10 minutes and full charging is at 120 minutes. Music lovers would not want to spoil their music enjoyment with some low performance gadgets. This is the time where Vasa BLÅ could come in handy with their great performances, you can literally feel the music and standing right in the middle of a concert whenever you put them on! With a gadget like this, melomaniac will get to experience music like never before! Spending for gadgets could be very costly for some people, especially people who are not earning much like me! Vasa BLÅ by Sudio Sweden is offered at a very affordable price with FULL accessories! Now with only RM398, you can grab this high quality gadget and start enjoying music that perfect for your ears! Also, this could be a great gift for Christmas or any occasions too! What's even better? Go to http://www.sudiosweden.com/my and quote JJZAI] when you make payment and you will be entitled for a 15% discounts! This DISCOUNT does not only limit to Vasa BLÅ but it works on all the products from Sudio Sweden too so make a move and grab your favourite earphones while the code still active! Whether is is a holiday getaway, your normal gym routine or a casual day out, Vasa BLÅ by Sudio Sweden can be your best companion giving you the best music enjoyment and also works perfectly with your smart gadgets! Visit www.sudiosweden.com/my today grab your own Vasa BLÅ and start to enjoy music with the best experience ever!